← Happy National Bomb Pop Day! Y.A.P. Time!! Have you ever tried “Universal Yarn” brand? Since I’m still working on a few projects that I can’t reveal yet … I thought I might make another Yarn Appreciation Post! A few days ago I put together some colors for one of my crochet elves to make cupcake slouchy berets for Renegade which is coming up soon (yes, I am freaking out! no, I haven’t been able to spend any time yet on new designs which I’m dying to write!). 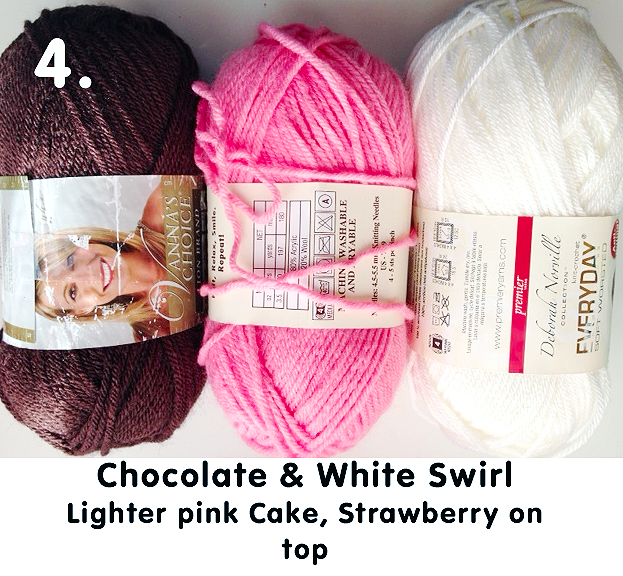 I am always on the lookout for the perfect pink when it comes to a nice, worsted weight acrylic. 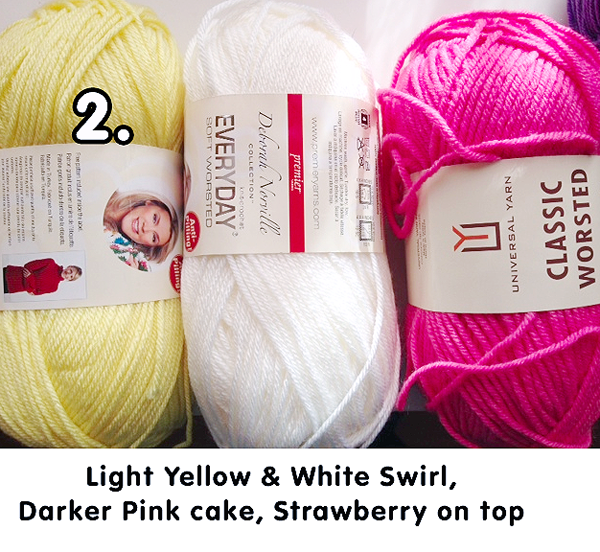 I recently stumbled upon Universal Yarn “Classic Worsted.” They have two shades of pink that I’m pretty crazy about, Bubble Gum 615 (picture above in Photo 1) and Pink Rose 7117 (pictured above in Photo 2) (the colors don’t look as good on their website, FYI). Classic Worsted is 80% acrylic and 20% wool, and I don’t find it itchy at all. Universal also has a 100% acrylic line called Uptown Worsted, but I haven’t played with that one yet. It looks like they aren’t displaying all their colors yet, and I wanted to see it all before placing an order. The weight of the Classic Worsted is a bit lighter than Lion Brand Vanna’s Choice or Deborah Norville Everyday Worsted. If you are familiar with Knit Picks Brava Worsted, I would say that they are pretty similar, except Knit Picks has a bit more of a sheen. 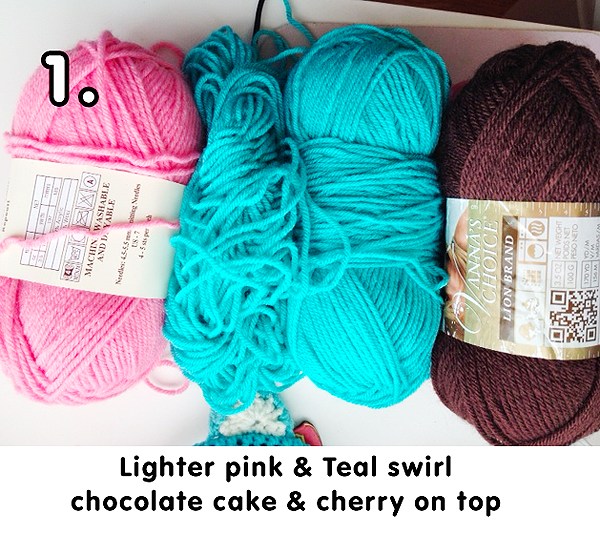 Classic Worsted needs to step it up in the blue/aqua/teal department, but I am definitely totally into these pinks! Most big box worsted acrylic pinks are too gray and washed out for me, or, just baby pink. These are definitely in the Pepto Barbie zone, which is right up my alley! Each ball is $6 from the Universal site, which is obviously a bit spendier than big box yarn prices, but for someone like me who depends on color to evoke a certain look or feeling, I’m happy to pay the extra! This entry was posted in Crochet and tagged yarn. Bookmark the permalink. 15 Responses to Y.A.P. Time!! Have you ever tried “Universal Yarn” brand? I just wanted to say that I love your blog, and that for some reason while I’m reading your posts I just imagine you typing them with the Doogie Howser theme playing in the background. Wow those pinks are awesome! On their site I would have never selected them, the color shows nothing like it does here. Yeah that is a real bummer about online yarn shopping….. you never know what the heck the colors actually look like! Ooo! Yarn review! I’ve yet to order something online, but this totally makes me want to go in the store and pet…I mean inspect….all the yarn! This is a really nice yarn – it’s one of the first yarns I crocheted with and I got it at my LYS. They have a lot of colors 🙂 And feels really nice to crochet with! My LYS just started carrying it. I’m very intrigued!!! 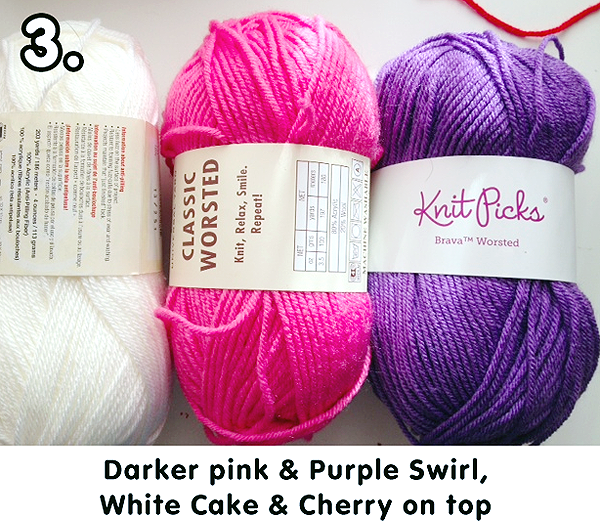 The pink and purple swirl with the white cake is my favourite colour combo!! It reminds me of Good N Plenty candy! Thanks for the heads up on Universal Yarn. I appreciate yarn lines with a wide variety of colors. I’m always on the look out for silver grey yarns which are useful for droid hats. Hey! I just thought I would let you know, if you call Universal they would probably send you color cards of any yarns you are interested in. I used to work there and they always have a ton of color cards for designers and stores.